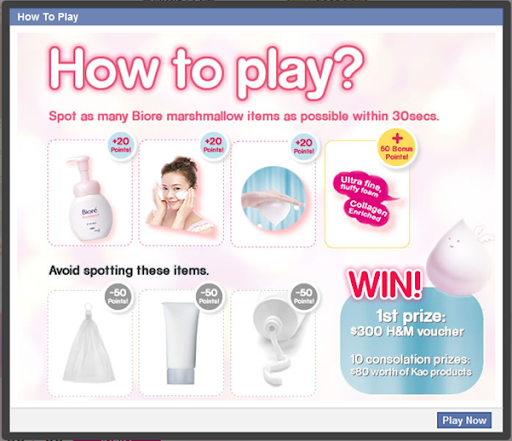 Bioré has always been high on my list of favourite drugstore brands. Having used their cleansers before and finding them oh-so-moisturizing, of course I was intrigued when I saw the Marshmallow Whip Facial Wash. And I was lucky to have The Sample Store sent me a bottle last month! When we are cleansing our face, we can get a tad too rough. This creates stress and increases the chances of us getting pre-mature wrinkles and skin that lacks bounciness. Apparently, one of the Japanese ladies' habits is to foam up their cleansers. In this way, the smooth, dense (When you flip the foam upside down, it doesn't drip!) and bouncy foam reduces the unnecessary stress and it cleans better too, with finer bubbles! I have been using this for close to two weeks now, so what does my skin say? Just like what Bioré promises, the foam's dense and isn't the least bit drippy. It smells like the other Bioré cleansers which I have used, clean and pleasant. The bottles advices 1-2 pumps, but just one pump's more than enough to cover my entire face. What I do is that I pump the foam and just use it on my face directly! There's no need for any sort of lathering because it's all foamed up already! To bounce things up a little, Bioré has the Marshallow Whip game! You stand a chance to win H&M vouchers (Oh, H&M!) and of course, Bioré's products! The game's really fun and simple! After that, there are questions on the facial wash that will garner you bonus points! TGIF, Muffins! Have a great weekend! RAMBLINGS: This goes way beyond. RAMBLINGS: School rocks in really strange ways. RAMBLINGS: What's your favourite colour? SPOTTED: Win a 16GB iPad with Vichy Spa Water! RAMBLINGS: There's a grey cloud over my head.